We are located between Southport's famous Lord Street, an elegant tree-lined boulevard that still retains its Victorian charm, and the lakeside promenades that are ideal for that relaxing stroll you have been promising yourself. 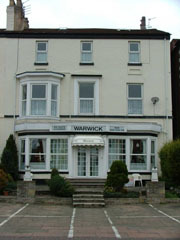 We are also only two minutes walk from the Southport Theatre and Conference Centre, making The Warwick is ideal for anyone attending the variety of shows or conferences held at this popular venue. Our high level of repeat business speaks volumes. We provide a friendly and informal atmosphere with an efficient personal service can assure cleanliness with our 10 rooms. Perhaps one of Southport's greatest appeals is for the serious golfer. Nowhere else in England can you find such a high concentration of championship, quality courses, all within easy reach of the town centre and The Warwick Hotel. Situated in the heart of Southport with a choice of top class gold courses on the doorstep, our 10 bedroom, fully licensed, family owned guest accommodation prides itself in offering unrivalled hospitality. Relax between rounds in one of our standard / en-suite rooms, enjoy our excellent hospitality, competitively priced late bar facilities, let us get you in the swing with a full English breakfast. Considered by many to be the finest of all, Royal Birkdale has hosted every major event in the fame, including eight Open Championships, two Ryder Cup Matches, the Walker Cup, the Curtis Cup and many major amateur events. We have teamed up with " Out to Play Golf" to bring you some great golfing offers and give you the oppurtunity to sample some of the areas finest gold courses.